Wednesday, November 8th, 2017 at 1:40pm. Homes are actually more affordable now than they were in the late 1990s, according to the latest Mortgage Monitor Report by Black Knight Inc., a mortgage data and performance information provider. Interest rates have plunged by 40 basis points over the past six months. However, the bulk of the potential savings is offset by the accelerating rate of home price appreciation across the country. Sunday, October 15th, 2017 at 10:43am. Tuesday, December 1st, 2015 at 3:33pm. Homes with classic architectural design elements continue to entice buyers wanting a home with a bit more personality and drama. But what some buyers don't know is that many of these aesthetically appealing elements actually have functional purposes in the home as well. If you have listings with any of the following traditional architectural features, make sure to let prospects know that not only do they add value visually, but also to the overall quality of life of a home. Monday, November 23rd, 2015 at 3:30pm. 1. Plastic furniture covers: While you may be trying to keep the furniture clean, those thick layers of clear vinyl all over furnishings will not make guests feel welcome or comfortable as they squish into a Saran-wrapped chair. Tuesday, April 28th, 2015 at 12:35pm. Next to sunshine and lead surges, seller slip-ups are one of the most common things spring brings. Each year, too many sellers find innovative ways to kill a deal or chance at maximizing profit. 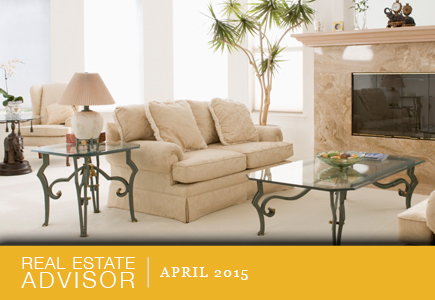 All the news points to the heat and low-inventory trends in today’s market. The good news is, many sellers have the confidence to get in the game. The bad news is that too many will do so thinking they will sell for top dollar in a flash. Sunday, April 12th, 2015 at 8:09am. Tuesday, December 30th, 2014 at 6:39am. Thursday, December 18th, 2014 at 2:41pm. Summer may be real estate’s busy season, but winter offers great opportunities for buying a house, especially for renters looking to become homeowners, growing families trading up to larger houses and baby boomers seeking homes to fit their evolving lifestyles. Generally speaking, your housing choices during the late fall are still healthy. October and November are great months to go house hunting. December is usually sparse, market-wise, but if that fits your timeline, you could luck out. Wednesday, December 3rd, 2014 at 10:25am.